The Freeman Professional 18-Gauge L Cleat Flooring Nailer offers an affordable solution for the professional and do-it-yourselfer for installation of dense wood applications such as Bamboo, Brazilian Teak and other exotic hardwoods. The driver blade is made of hardened steel with an aluminum cylinder and high-quality rubber O-rings while the body of the nailer is constructed of durable die-cast aluminum to stand up to daily use. This nailer features 3 interchangeable base plates that provide stability and protect flooring surfaces from scratches. The nailer comes with a high quality fibreglass no-mar rubber mallet. This nailer uses 18-gauge 1-1/4 Inch 1-3/4 Inch L-cleats with a magazine capacity of 120 pieces. Freeman 7 year limited warranty please call 888-669-5672 with questions. The Bostitch Flooring Stapler Kit features an aluminum housing for jobsite durability and high speed pneumatic operation to increase productivity over manual tools. It precisely drives staples at proper angle and depth, and has an extra wide composite base plate for added stability. It also features a long reach handle for added comfort and control. Kit includes: Stapler, Graphite Mallet, Pre-Finished Flooring Adapter Foot, and 1/2 In. and 3/4 In. base plates for installation of hardwoods. Features driving power of 420 In. Lbs. and Fastener Range 1-1/2" to 2" 15-1/2GA staples. Magazine Capacity: 92 staples. The Freeman roofing nailer is an amazingly powerful nailer that is extremely fast with its nail delivery. The Freemans PCN45 coil nailer can be used for asphalt shingles, cedar shingles, roof and wall sheathing, flooring underlayment, siding installation, wood box assembly and fencing. It shoots 15-degree 11-gauge coil nails ranging in size from 7/8 Inch to 1-3/4 Inches. The efficient side-loaded magazine has a capacity of 120 nails. The PCN45 is designed for comfort and protected by front and side bumpers and equipped with 360-degree adjustable exhaust to direct exhaust away from your face. The body of this gun is constructed of die-cast magnesium for low weight and durability. Anodized aluminum parts provide less wear and tear and smoother nail feed. Heat-treated one-piece driver blade reduces the risk of internal failure, ensuring a longer tool life. A dust cap and internal air filter keep the nailer free from debris for smooth, clean operation. For fine-finish applications such as moulding, chair rail and cabinetry, use this Freeman Pneumatic 15-Gauge Strip 34-Degree Finish Nailer. The die-cast aluminum housing and anodized aluminum parts are durable but remain lightweight for easy, continuous use. The nailer features tool-free depth adjustment and nose access for easily clearing jams. 360-degree adjustable exhaust port directs exhaust away from your face. Compatible with 1-1/4 Inch - 2-1/2 Inch nails. This Freeman Pneumatic 16-Gauge Strip Straight Finish Nailer is excellent for fastening 3/4 Inch - 2-1/2 Inch nails in carpentry work such as moulding, chair rails, door casing, cabinetry and furniture construction. The convenient design allows you to clear jams, change the depth drive and adjust the 360-degree air exhaust without needing any tools. A no-mar tip leaves only a small trace on the work surface to save you time during finishing applications. Includes anti-dust cap and internal air filter for clean operation. 18g L-Cleat Flooring Nailer The Freeman Professional 18-Gauge L Cleat Flooring Nailer offers an affordable solution for the professional and do-it-yourselfer for installation of dense wood applications such as Bamboo, Brazilian Teak and other exotic hardwoods. The driver blade is made of hardened steel with an aluminum cylinder and high-quality rubber O-rings while the body of the nailer is constructed of durable die-cast aluminum to stand up to daily use. This nailer features 3 interchangeable base plates that provide stability and protect flooring surfaces from scratches. 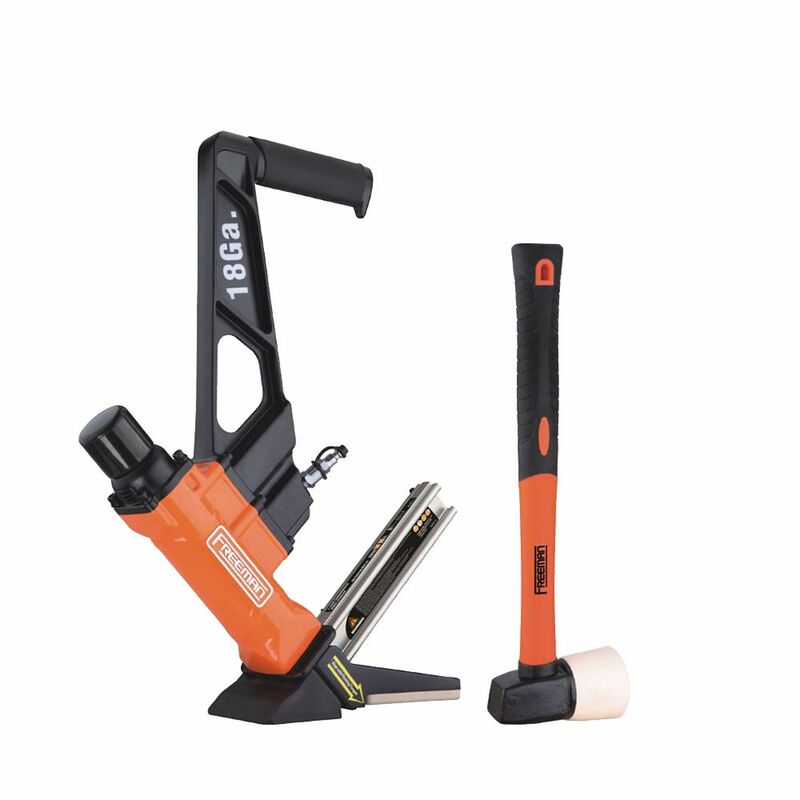 The nailer comes with a high quality fibreglass no-mar rubber mallet. This nailer uses 18-gauge 1-1/4 Inch 1-3/4 Inch L-cleats with a magazine capacity of 120 pieces. 18g L-Cleat Flooring Nailer is rated 4.6 out of 5 by 29. Rated 1 out of 5 by Josh from The gun started to leak air, internally, after the first... The gun started to leak air, internally, after the first day of use. Rated 5 out of 5 by Mmg from This nailer was easy to use! Very well-made!... This nailer was easy to use! Very well-made! Rated 4 out of 5 by Damian from So far I'm really pleased the this tool, it has... So far I'm really pleased the this tool, it has worked flawlessly with the 1 3/4 inch cleats. The one thing that I would mention is that if you are putting down a thick (3/4 inch) floor with a thicker underlayment you may want to consider a nailer that will do 2" cleats. Rated 5 out of 5 by Smitty from Just did 2200 sq ft of bamboo flooring. Worked great. Just did 2200 sq ft of bamboo flooring. Worked great. Rated 5 out of 5 by Paul from This flooring nailer did not miss a single shot straight out of the box. Just select the floor th... This flooring nailer did not miss a single shot straight out of the box. Just select the floor thickness plate add a few drops of the supplied oil, and start nailing.